Short Info: Union Public Service Commission has declared the UPSC Geologist Result 2018 for Geologist and Geo-Scientist. The UPSC Geologist mains examination was conducted on 29th June, 30th June, and 1st July 2018. Candidates who have successfully participated in this examination are able now to check their result. The result is available on the official website of it from 30th January 2019. Candidates need to visit the official website at upsc.gov.in with respect to check their result. This result will tell the candidates that they are selected for further process or not. UPSC has successfully conducted UPSC Geologist mains examination on 29th, 30th June, and 1st July 2018. Now, it is going to tell the appeared candidates about their selection. Appeared candidates are able now to know about their performance in the UPSC Geologist and Geo-Scientist Examination. The candidates have shortlisted in a PDF file by their Roll Number. If they are qualified for this examination, they will call for further process. The candidates who have shortlisted in the result pdf will call for the Interview process. 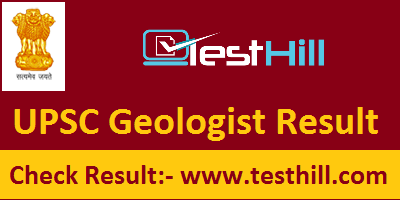 The UPSC Geologist result 2019 is available from 30th January 2019.